We have received several emails of late from loyal Bearleader readers asking us to highlight more great food venues in and around the places we cover. You asked for it and here it is, the first of our new “Eat a City” series. 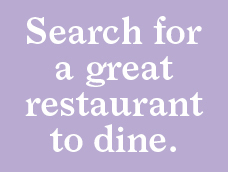 Each time we visit a city we will be searching out four great places for you to dine. We will be picking options in different price ranges, styles of food and places that are good to visit at different times of the day. 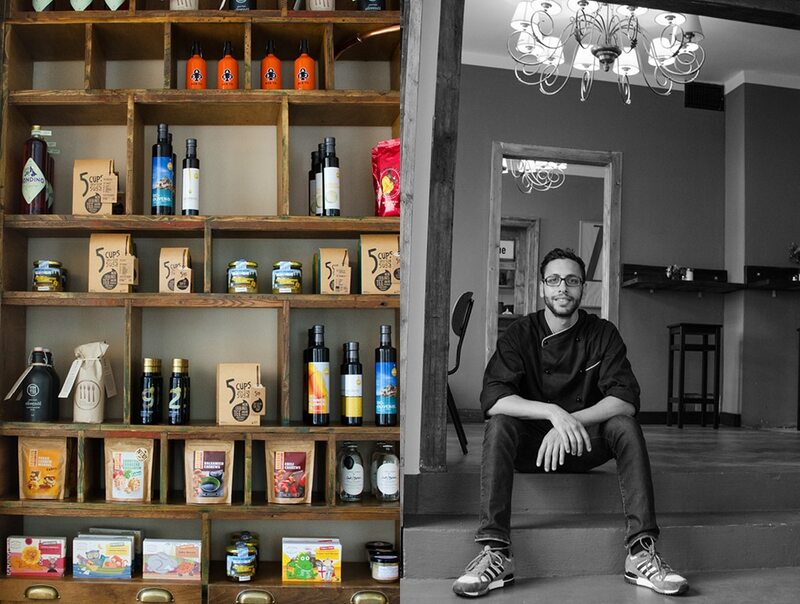 All our suggestions will serve fresh, local and mostly organic food. And of course any place we suggest will be a fun outing. First up, Eating Munich. If you are like me, images of Wurst (sausages), pretzels and beer immediately come to mind. 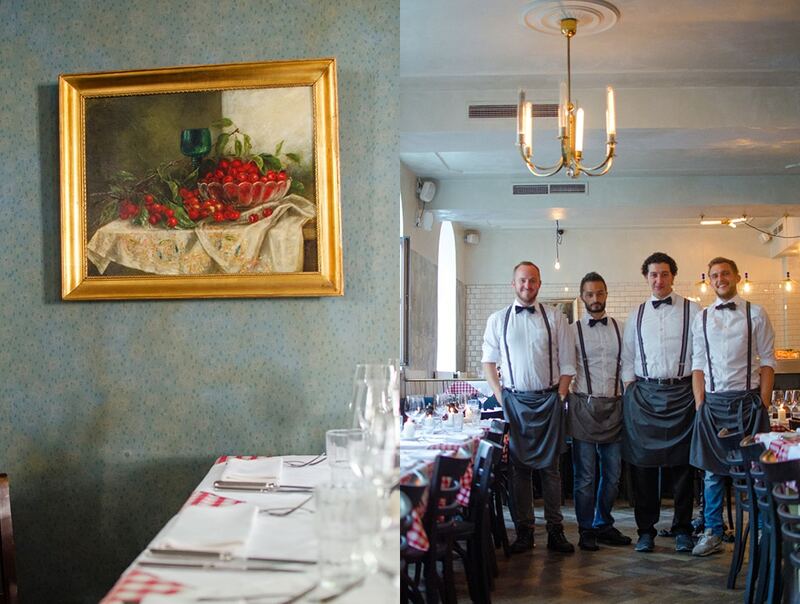 But if you move beyond the Oktoberfest stereotype, you will find a small group of enthusiastic chefs working with local suppliers, whipping up a cuisine that is uniquely München. 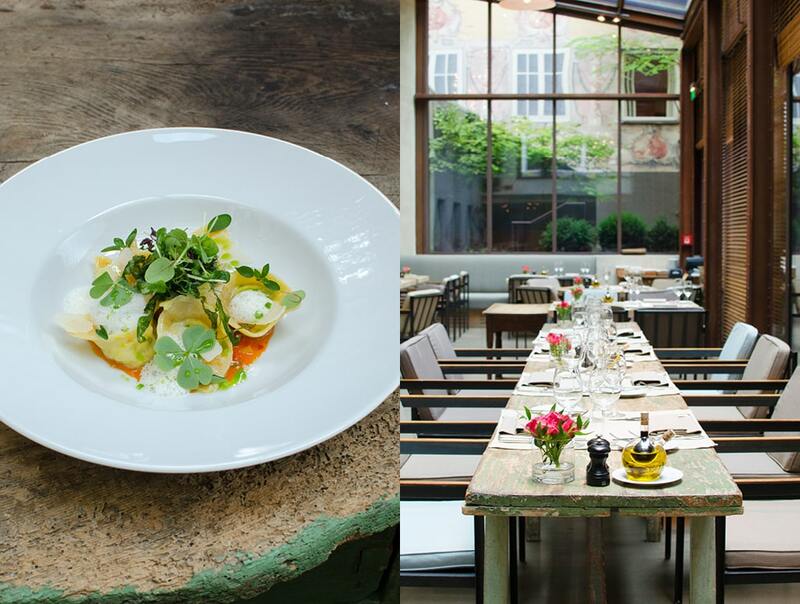 Yes, it is true, if you visit Munich any time in the other 11 months of the year you will have an equally good time, with a bevy of food and activity options that will delight, inspire and entertain. Here is what we found. The Hotel Bayrischer Hof is a family-owned Munich institution, in operation since 1841. It has recently been renovated to enhance its five-star luxury reputation for another generation. 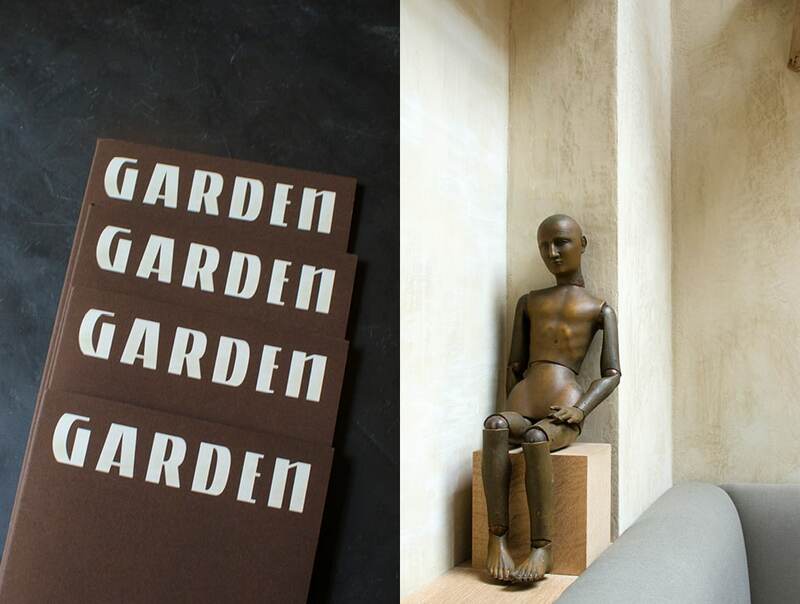 Along with the hotel, the long-running Garden restaurant has also received a makeover under the direction of famed Belgian designer and art dealer Alex Vervoordt. 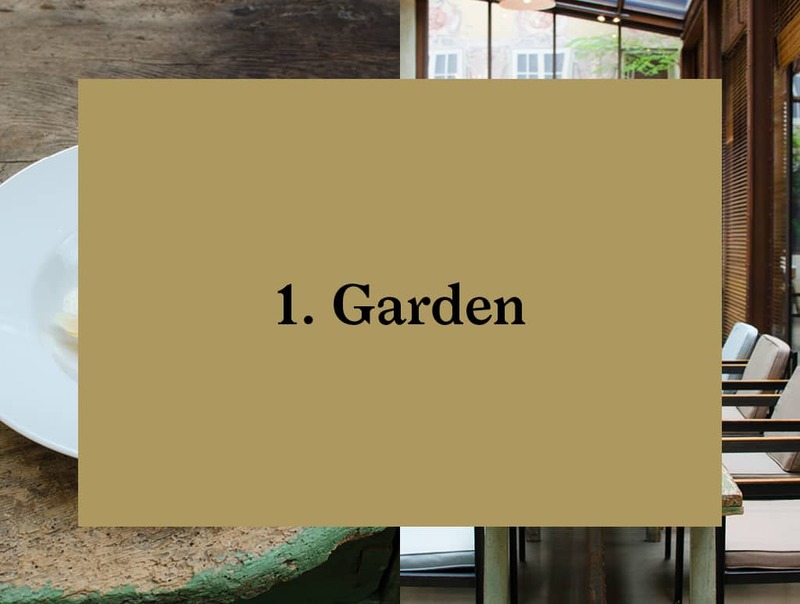 Vervoordt transformed the Garden’s classic winter garden into a light-and-airy glass-enclosed dining room reminiscent of an artist Studio. Large expanses of glass, rough industrial materials and well-worn patinaed surfaces combine with a mix of natural linen fabrics to produce a dynamic lively space. 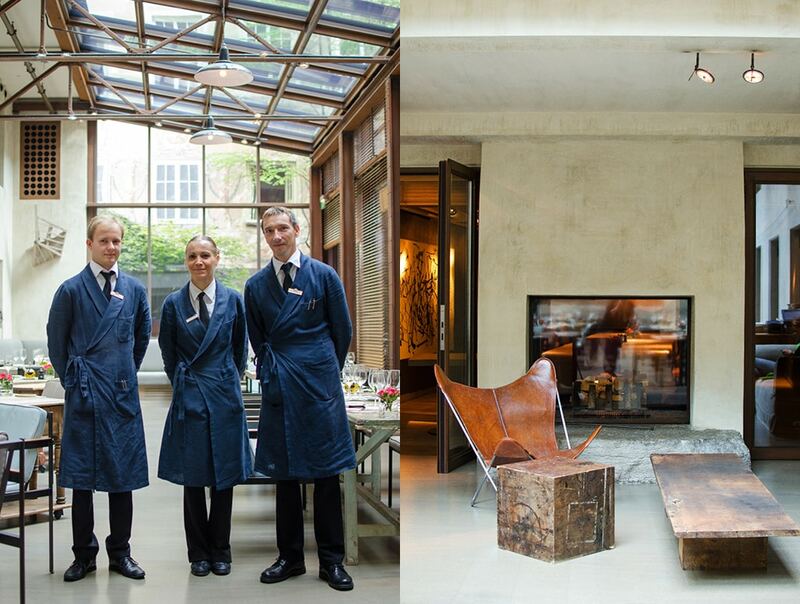 Vervoordt controlled all visual aspects of the renovated restaurant with menus designed to his specifications, and commissioned fellow designer Ann Demeulemeester to produce uniforms for the wait staff. Demeulemeester created a work-coat-inspired Kimono in heavy dark blue linen, which is a brilliant and practical flourish that animates the new dining room. 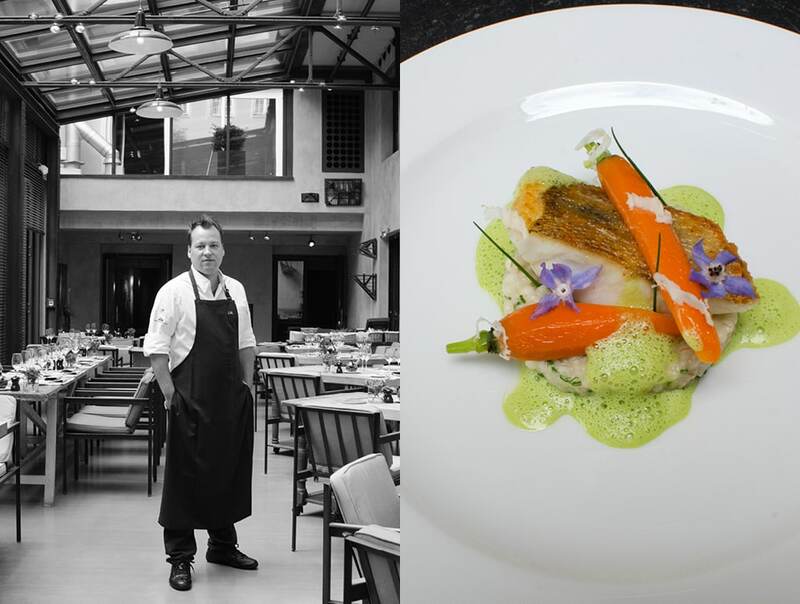 The cuisine is just as inspiring as the décor, with chef Jan Hartwig at the helm since May. This is his first head chef position and along with his young, energetic creative team, the kitchen is producing solid dishes that seem quite mature for the short time he has been in charge. A real craftsman, Jan’s dishes all feature carefully composed intriguing flavor combinations, each full of charm and subtle in taste. You will also find a great variety of thoughtful meatless options equal to his more carnivorous concoctions. 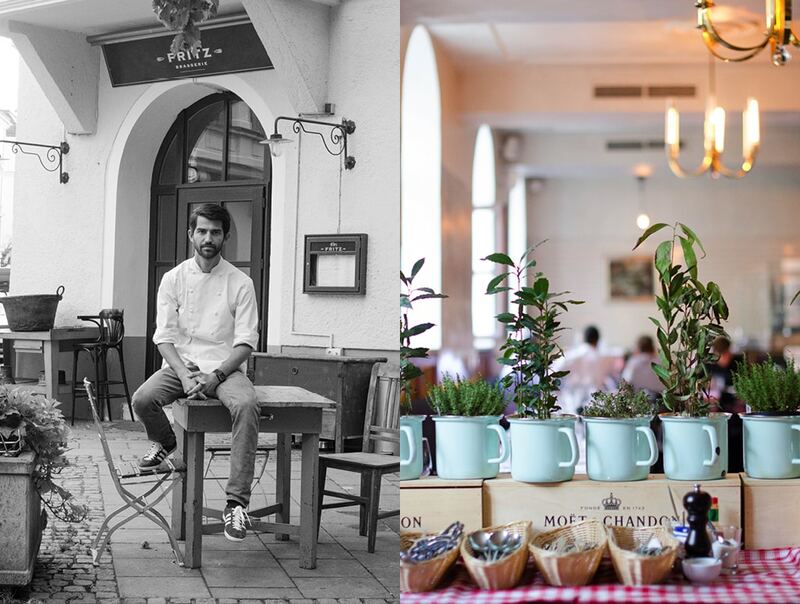 Jan’s love for effusing various fresh herbs into his dishes is a thread that runs through the evolving seasonal menu. 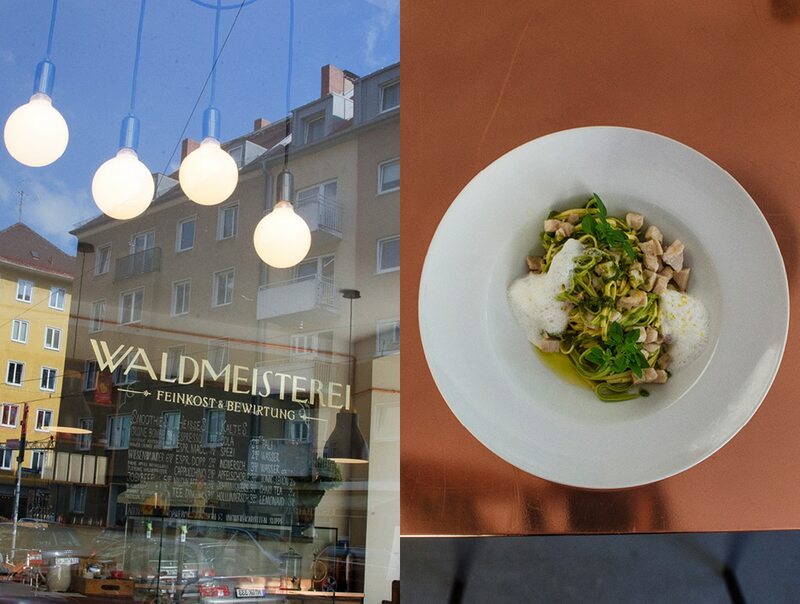 Now we are heading over to the Maxvorstadt district to check out Waldmeisterei, a favorite eatery of design-savvy locals and students from the nearby Ludwig-Maximilians University. On arrival we are greeted by co-owners Damir Stabo Stabek and Christina Pawelski. 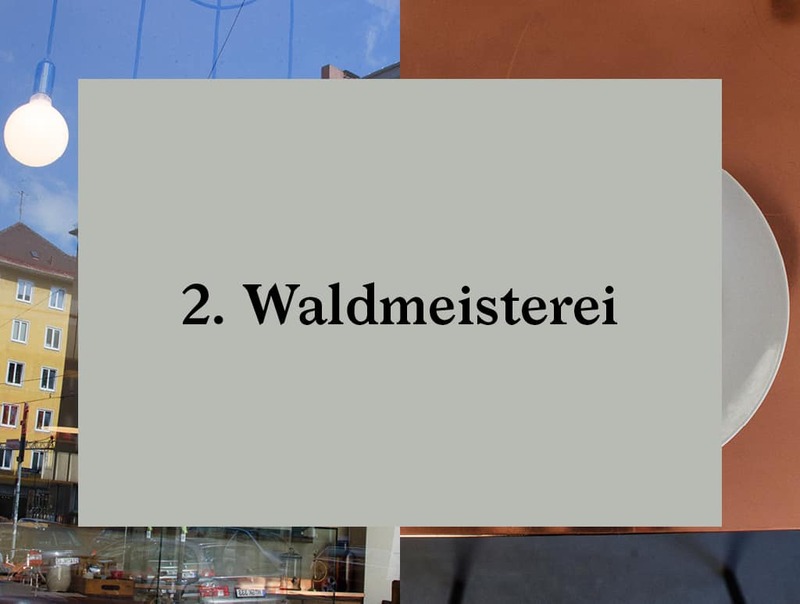 We sit down for some cake and a fresh lemon/elderflower gespritzt to chat about how the recently opened Waldmeisterei came to be. 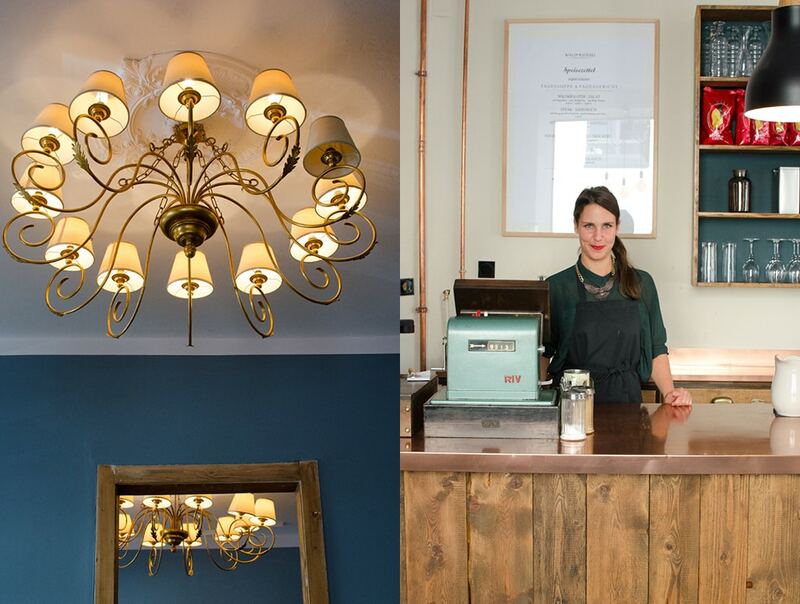 Stabo set out to create a breakfast-to lunch-time venue, offering simple, fresh food with a concentration on great cakes and coffee. 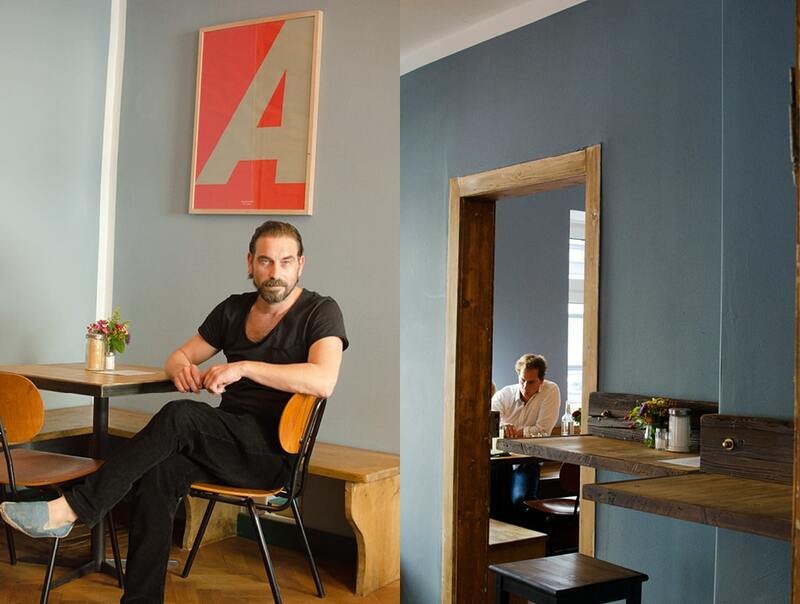 It is part deli, part cafe, part local hang out. As we talked there was a steady stream of patrons coming and going, clearly on their daily pilgrimage to Waldmeisterei. The interior is quite new but constructed with recycled materials to look well-worn from day one. 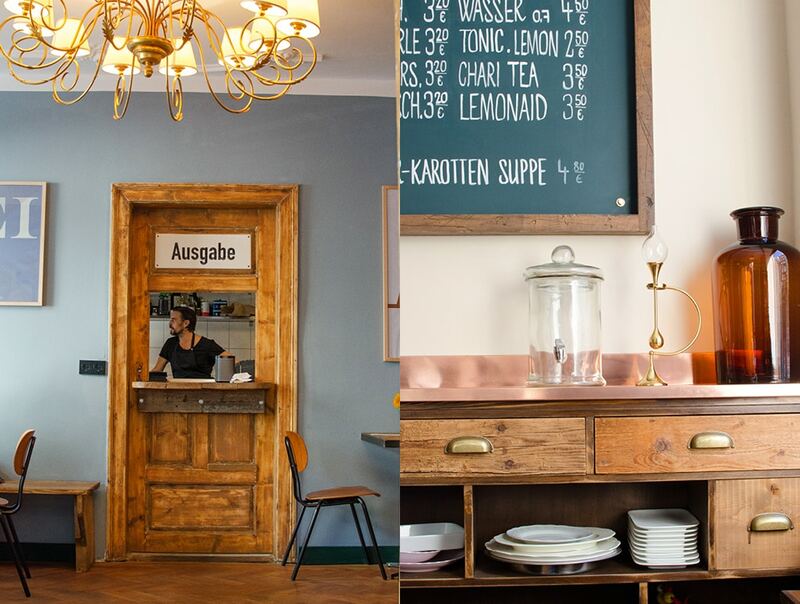 Walls and furniture are built from rough, reclaimed wood with bright copper-covered counter tops where cakes and other to-go offerings are displayed. Vintage chairs and chandeliers are paired with bold graphic posters to complete the comfortable and modern look. Christina bakes many of the cakes fresh daily. And you will find a great selection of seasonal lunch dishes on offer each day, prepared by lunch chef Aramis. 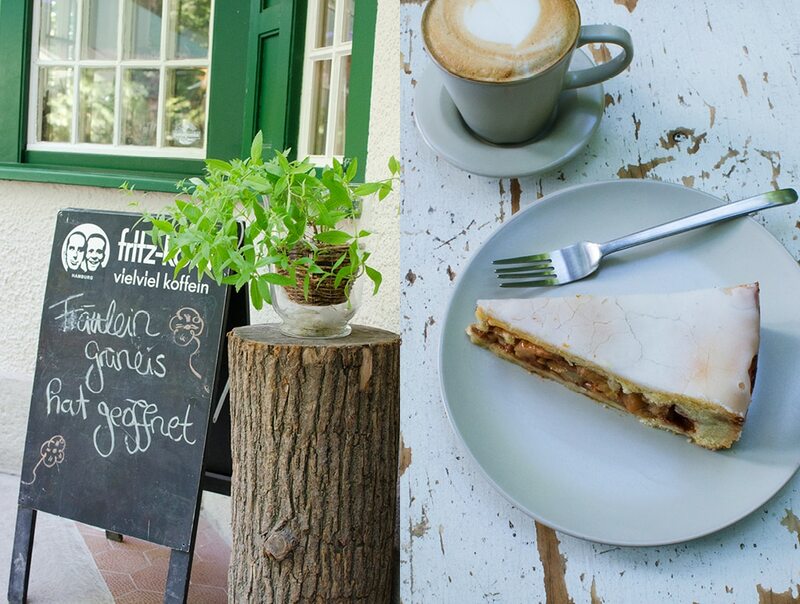 Afternoon is a great time to visit for “Kaffee und Kuchen”. A very German tradition that is still observed religiously by locals. 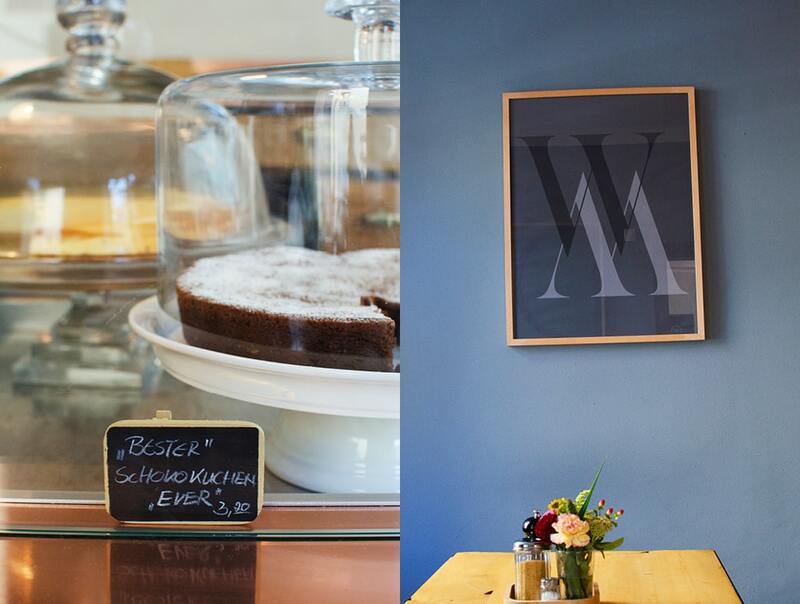 And with Christina’s cakes, all the better at Waldmeisterei for your afternoon break from sightseeing. Just a short trip south and east and we arrive at the southernmost point of the English Garden, where the Eisbach River rushes into the park. Of all the restaurants I have visited lately, this one has the best back story. Built in 1906 as a public toilet for the English Garden, it served its intended purpose for many years. Eventually the building acquired a reputation for drug dealing and other illicit activities, and it was officially boarded up and left to decay. Then one day a few years ago, the overgrown ruins caught the attention of local residents Sandra and Henning Duerr, who somehow had the vision to see that this dilapidated English Garden folly could be put back into service for public use as a restaurant. Having a vision is one thing, but bringing that vision to fruition is quite another. Standing in Sandra and Henning’s path was the city’s building department who would have to give them permission to occupy the property in order to move their plan forward. They soon found out that this permission was not going to be easy to extract. As Henning tells it, without Sandra’s dogged determination it would never have happened. Sandra attacked the problem with such tenacity that the city finally surrendered and gave permission, if for no other reason than to stop Sandra from calling them every day. With all the paperwork in order, the project began and the building was soon restored to its original exterior appearance. Henning did most of the work himself, and in 2011 the building reopened. When you are there, notice one of the few original details that remain from the original building, the sign “Frauen”, from the women’s room entrance. 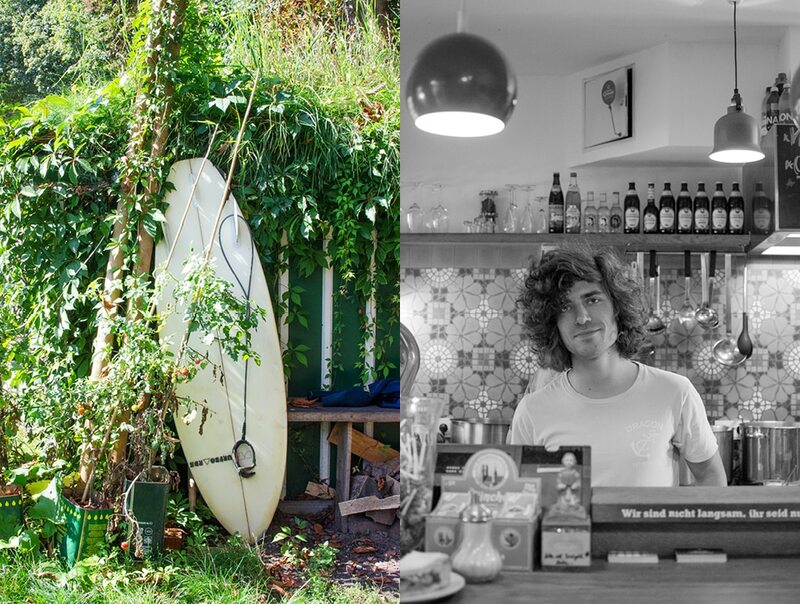 Now an integral part of the neighborhood, the restaurant attracts a healthy lunch crowd from local businesses, tourists and surfers arriving from the nearby Eisbach River. There are not too many places you can eat lunch with such a diverse crowd. 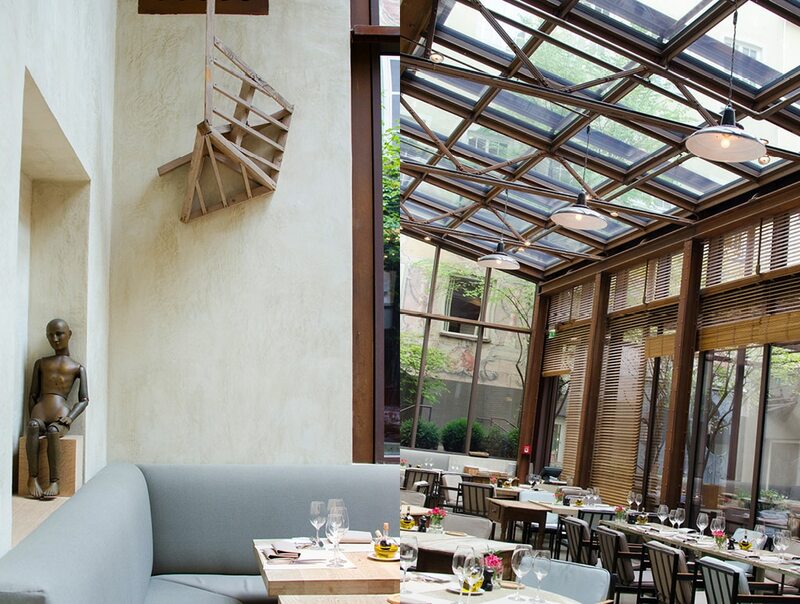 The lunch menu changes daily, based on what’s available locally, with two dishes served as long as supplies last. 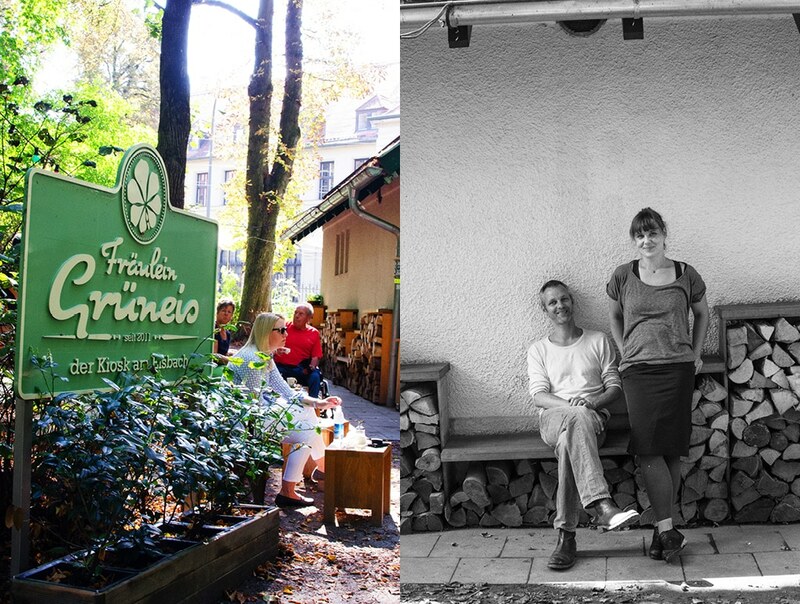 Sandra and Henning live next to the local green market so they can easily buy their produce fresh daily. A great selection of home-baked cakes and other treats are also available for dessert or “Kaffee und Kuchen” in the afternoon. 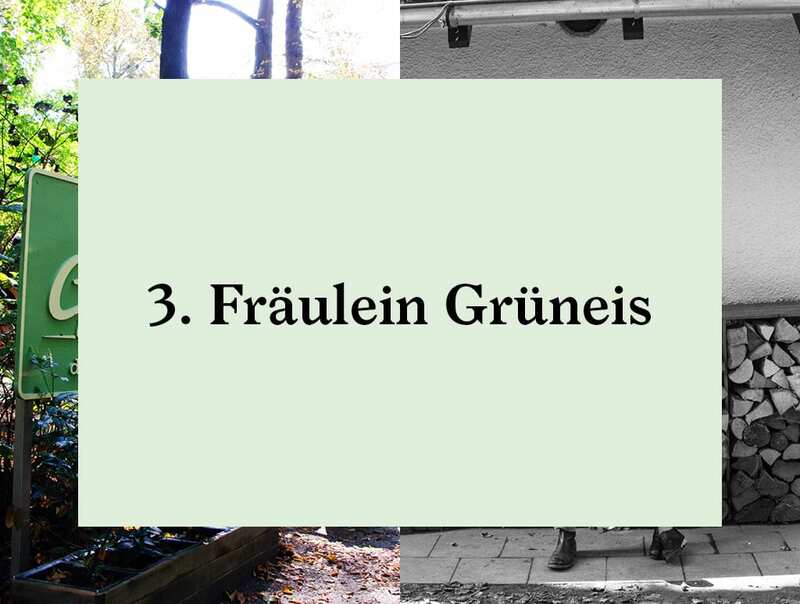 Fraeulein Grueneis is open year round. In the winter season, a small wood-burning stove in the main room is enough to keep everyone warm. And with the cold comes mulled wine season, which is well worth braving the cold for. Being situated within the English Garden provides more benefits than just a scenic location. To start with, there is a steady supply of wood from the local gardeners to keep the stove stoked all winter. And Henning told us they also tend several beehives in the gardens, producing a steady supply of their own Fraeulein Grueneis honey. 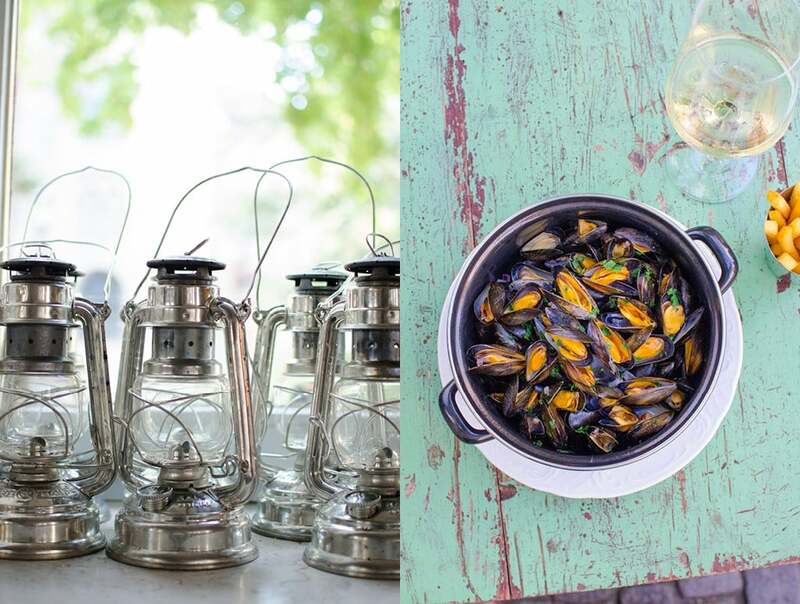 A great souvenir to bring home with you from your lunch in the garden. 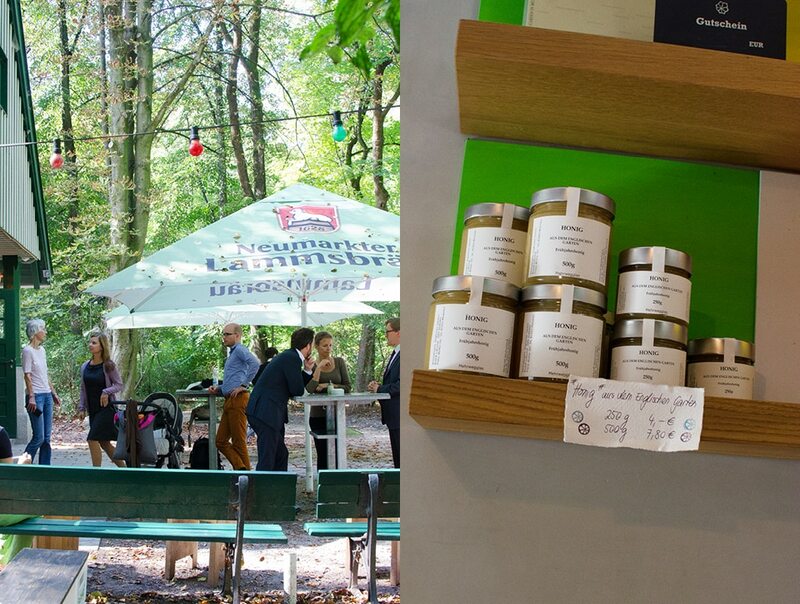 After lunch, be sure you stop by the bridge over the Eisbach River. From the bridge you get a prime view of the locals surfing the famous stationary wave. The Eisbach River is the only river surfing location in the world within a city. But that is a story for another time. The Franzosenviertel (French Quarter) district in Munich dates back to around 1871 when, to commemorate Germany’s war with France, many streets were named after battlefields where Germans were victorious. 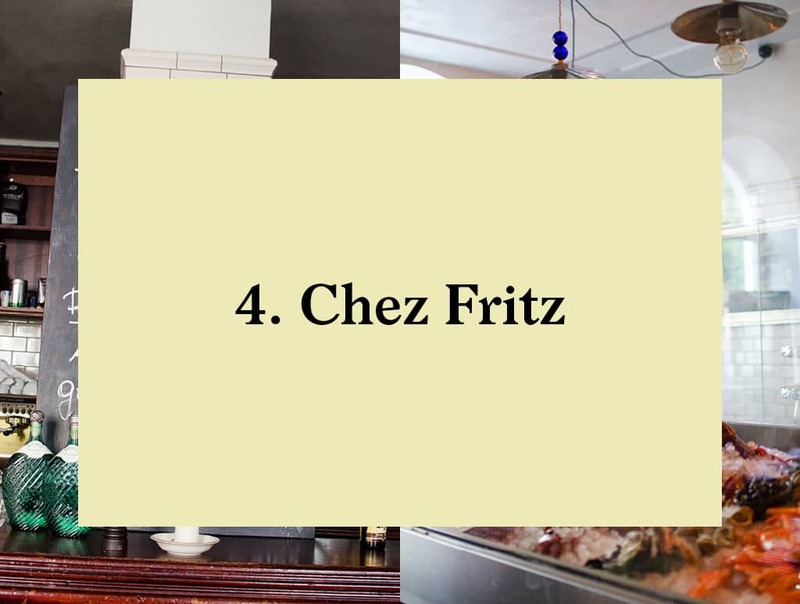 The energetic crew at Chez Fritz know their chops. The menu features a selection of French classics such as: Steak Frites, Entrecôte, Jarret D’Agneau, and Moules et Frites. Seafood figures prominently on the menu and the daily fresh offerings are on display for individual selection in the dining room. 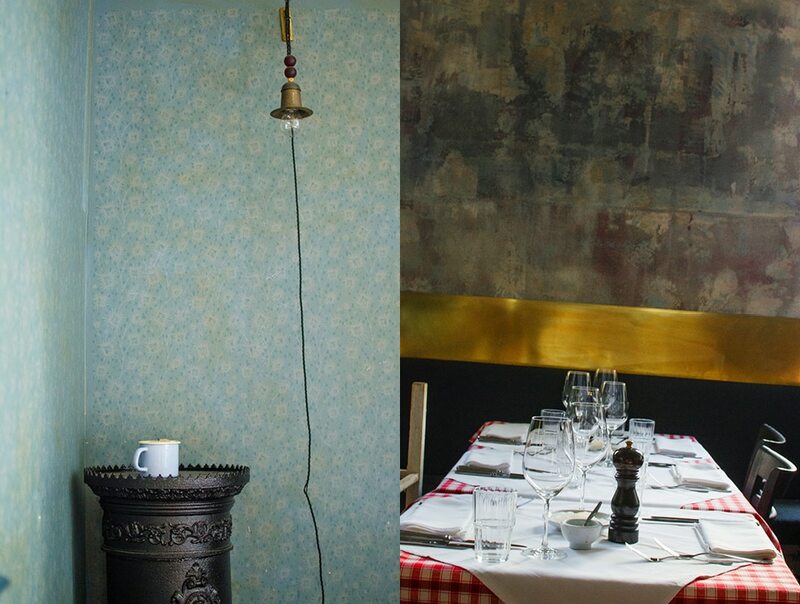 The dining room feels like it has existed for at least as long as the local streets bearing French names. 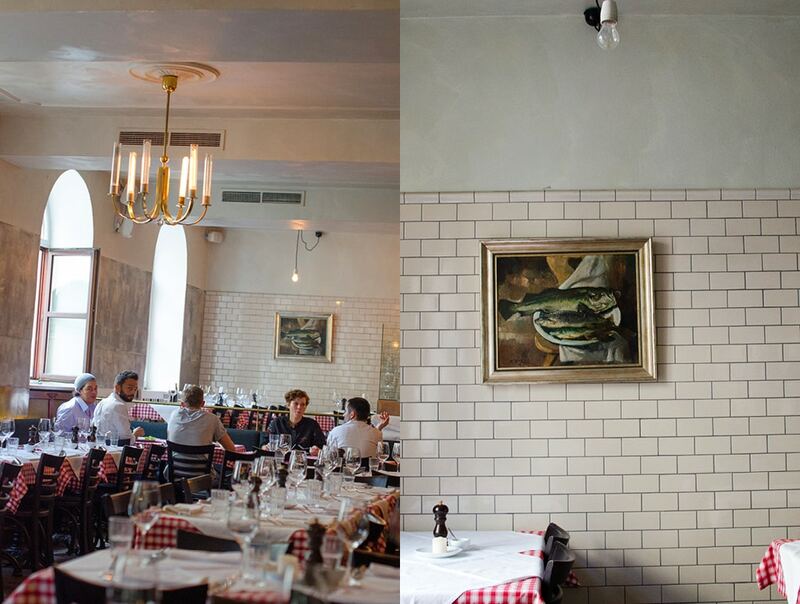 Whether by age or design, it’s a great room and just what you would want as a setting for classic French cuisine. 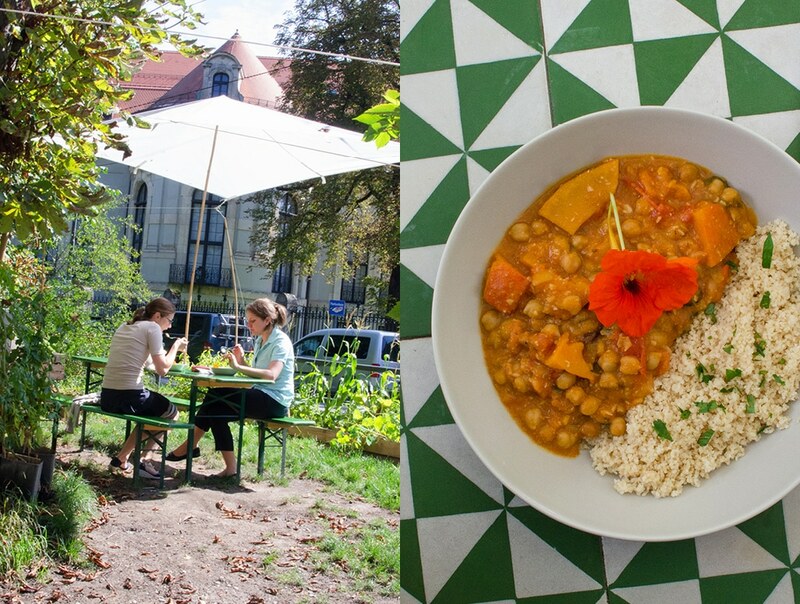 During the warm summer months, try to get a table outdoors in the shadow of the neighboring St. Johannes church. 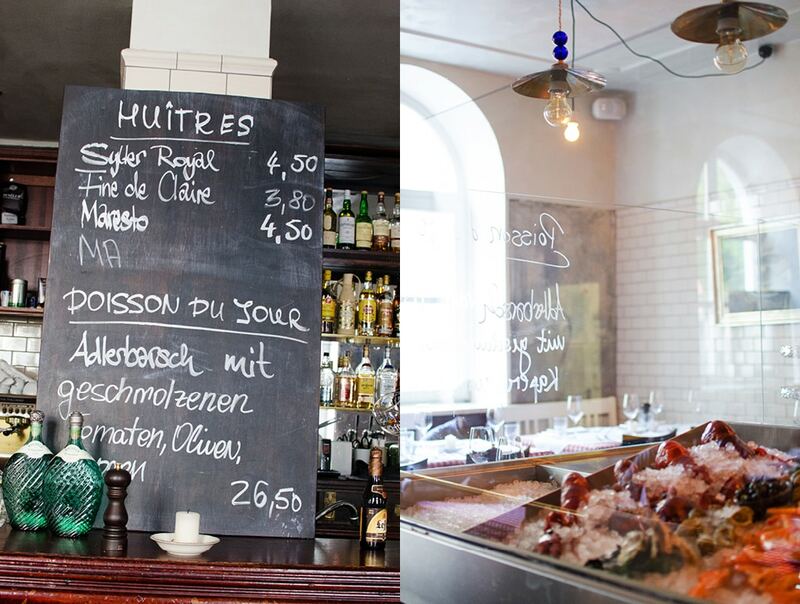 Chez Fritz’s eclectic mix of vintage furniture under the old trees of Preysingplatz adds to the old world ambience.